I am often asked about recipes for Bengali breakfasts and miserably fail to give a satisfactory answer. Though Luchi-alur torkari or Prota-Alur dom could pass as the epitome of Bengal's most favoured dishes for the morning but they are definitely reserved for special occasions. Unlike the Punjabi's or people from Delhi we Bengalis do not have a culture to go out as a family even on weekdays or order in Kulcha chana, Alu Paratha or puri sabzi from the local Halwais (sweet shops). We do have our versions of Kachori and cholar dal but no one absolutely no one orders or eats them on a regular basis. 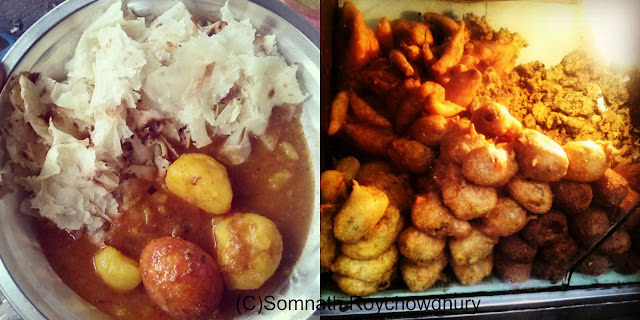 Kachori Potato Curry. Picture Courtesy Somnath Roychowdhury. You must Follow him on Instagram(streetgobbler) for more information about street food around Kolkata and much more. So the question remains the same. What does a Bengali eat for breakfast? And I believe the answer must be divided in two parts. What a Bengali eat at home on a regular basis and what a Bengali can eat if he/she wishes to have the breakfast from shops. Picture Courtesy Somnath Roychowdhury. You must Follow him on Instagram(streetgobbler) for more information about street food around Kolkata and much more. As a result of the long Colonial era we have pretty well adopted the style of an English Breakfast. The toasts, Eggs in many forms, Jam or Butter and fruits along with a glass of milk or tea mostly are found on the breakfast table across the middle as well as upper class families early in the morning. People who cannot afford it or have the power to digest gluten in the morning solely relies on Puffed rice or Muri. Yes across Bengal this is one thing that features on the breakfast menu. Sometimes with Ghugni (yellow peas curry), sometimes with chanachur (Bombay mix) or sometimes with plain milk and sugar. This is ubiquitous breakfast staple across all strata of people. The Muri Telebhaja or deep fried goodies like Peyanji, Beguni, Singara or Alur chop is another option mostly available in newspaper packets with a few shake of black salt and a free piece of green chilies at the roadside cha er dokan (tea shops). Petai parota, Telebhaja Picture Courtesy Somnath Roychowdhury. 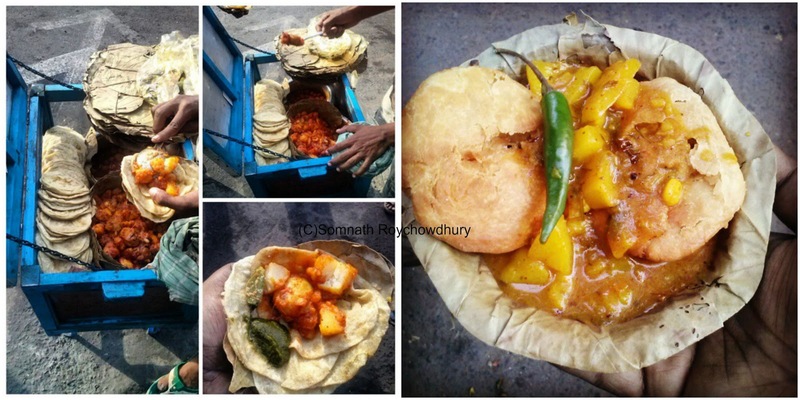 You must Follow him on Instagram(streetgobbler) for more information about street food around Kolkata and much more. The same shops will also offer quarter pound white breads, cut in half and toasted on charcoal fire. Which often is paired with a plate of runny ghugni sprinkled with chopped onion and green chilies or the malai (skin of milk) freshly gathered from boiling the milk. Some sweet shops even offer Pita or Petai parota, a soft flaky form of paratha/ flat bread prepared by slapping the flattened dough on a slab of stone for quite sometime. Which in turn activates the gluten so much that one can roll and stretch it thinner than a high quality paper. 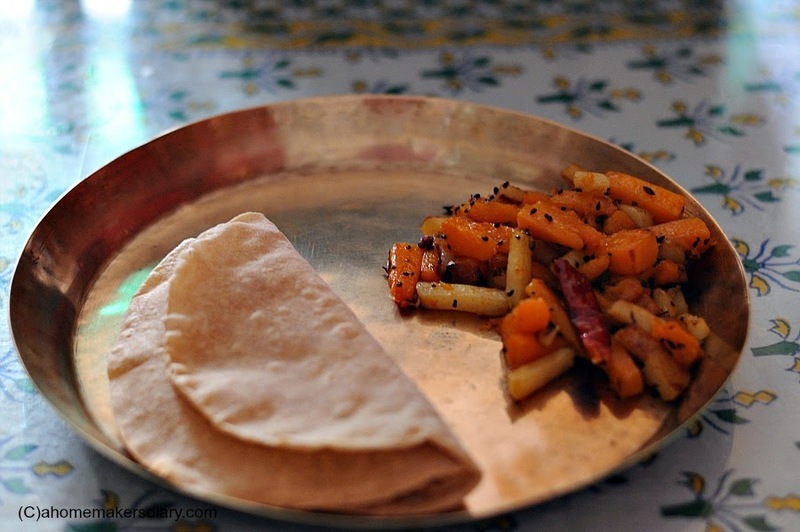 The resultant paratha which is almost like a dying art is soft, light and little chewy. The best accompaniment to these parathas is the leftover chasni or sugar syrup from the Rasgullas or spicy potato curry. At home the stories are different though. Like any thoughtful mother Bengali moms also want their kids start their day on a healthy note. So it's mostly toasts-milk or Muri dudh kala (puffed rice, milk and banana). Also after the green revolution Rotis (Indian unleavened flat bread) has grabbed a permanent place in some family's breakfast table. In summer with Alu bhaja or leftover torkari from last night's dinner and in Winter with steaming hot Kumro chenchki or bati torkari is something which even I look forward to some days. Tearing soft pieces of rotis and rolling them with just out of the pan curries is quite satisfying on a lazy morning. But the breakfast that I am going to share today is the eternal favourite of some Bengalis. 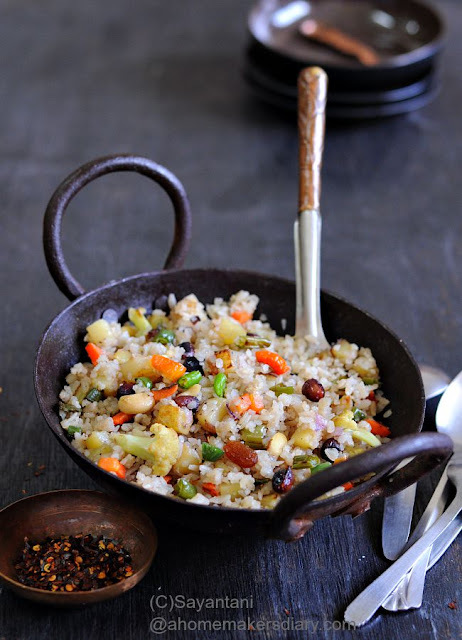 Chirer polao or beaten rice cooked with veggies, nuts, ghee and garam masala is quite a treat if done right. Though it looks and sounds very similar to Maharashtrian Poha but the taste is very very different. Chirer polao is cooked almost like how pulaos are cooked with ghee and nuts and is sweetened with generous pinch of sugar to give it a sweet after note. Below is my simple recipe, the way it's been cooked at home. Prepare the veggies, wash and keep aside. Peel and cube the onion. keep aside. Place the poha in a mesh sieve. Pick the dirt and wash it under running water. Let the water drain out properly. Make sure your poha gets little soft in the process or you will end up with thick chewy grains with veggies. Heat 1 tbsp oil and place the cubed potatoes first. 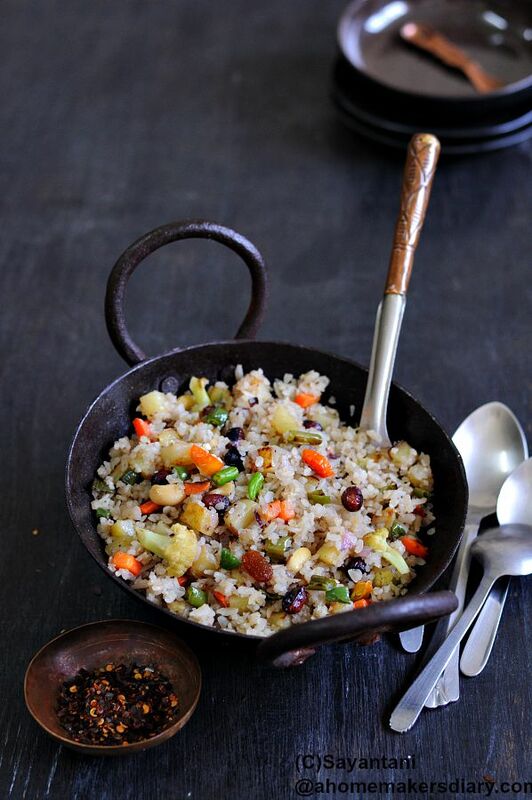 Sprinkle little salt after a minute add the cauliflower florets, beans, peas and carrots. Cook till they change colour and soft inside. Take out and keep aside. In the same pan add the peanuts and cook till they are crunchy. Take out and keep aside. Heat the rest of the oil and add the onion and chopped green chilies. Cook for a minute or till it turns pink. Add the cashews and raisins. Once they change colour and the raisins puff up add the washed poha. Sprinkle salt and mix with a very light hand. Do not stir vigorously or the poha will start to turn into a mush. Add in the fried veggies and mix. Adjust salt and sugar accordingly. 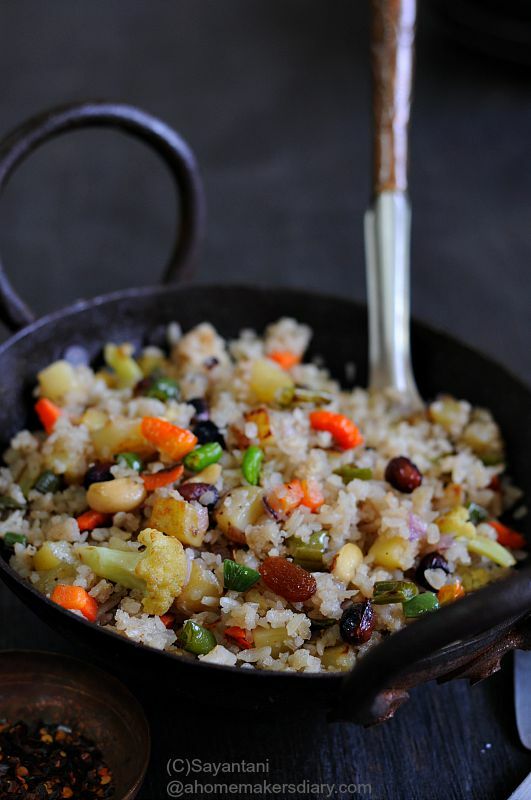 As per your taste and the quality of poha and veggies you might have to adjust the quantity of sugar. Sprinkle the ghee on top and mix. Cook on medium for 2-3 minutes and finish off with garam masala powder. Serve hot with a cup of masala tea. Use thick beaten rice not the very thin variety which is softened just with a sprinkle of water. Use more veggies for a better taste. You can replace garam masala with chopped fresh coriander leaves. The polao should be little sweeter with a hint of heat from chilies. So adjust accordingly. thanks for reading through the post Rafeeda. Yes truly said we Bengalis prefer muri over the other items...Sometimes people out of WB laughs and says Is puffed rice enough for the breakfast? Actually muri is easily digestible in the WB's climate.. Other things like puri, paratha or dosa is too heavy for that climate I believe.. 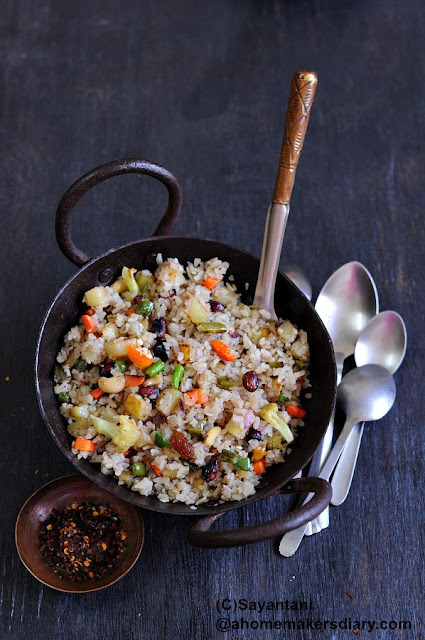 This Chirer pulao is enough to satisfy all the breakfast related queries for Bengalis. Yours looks amazingly tasty and delicious.